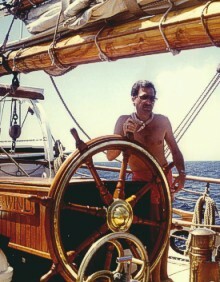 In 1985, my then partner and I were privileged to be aboard the Eye of the Wind when it sailed on one of its regular passages through the South Pacific. Based in Sydney at the time, the "Eye " as we affectionately knew it, had a routine over several seasons of making a passage from Australia to the Solomon Islands and New Guinea and then back down the east coast of Australia to Sydney before sailing to Tasmania and then returning to Sydney. At the time we were little interested in sailing but had recently trained as scuba divers and our dive club had chartered the vessel for its full passage through the Solomons, from Honiara to Ghizo and it promised remarkable diving conditions in almost virgin diving territory. We were not disappointed and that trip started a long love affair not just with diving, but also with sailing, and with the ocean generally, so much so that in the following year we decided to repeat the journey, only this time we would spend almost 6 weeks aboard instead of 3, once again joining the ship in Homiara but staying with it until we were put ashore in the Trobriand Islands at the end of our voyage. Not yet satiated with adventuring we were then to fly on to Madang on the north coast of New Guinea where we would join a goup from our home city, Adelaide South Australia, for another week of diving before returning to reality and home. The Eye of the Wind has held a place in our hearts and memories ever since. This collection of photos is my way of sharing these memories on a remarkable ship in a remarkable part of the world.